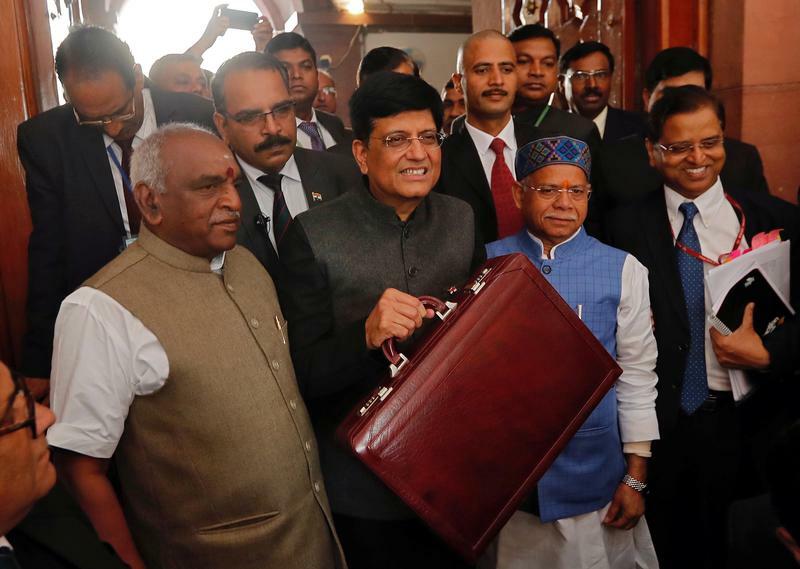 India's interim Finance Minister Piyush Goyal holds his briefcase as he arrives at the parliament to present 2019-20 budget in New Delhi, India, February 1, 2019. India’s interim Finance Minister Piyush Goyal set a fiscal deficit target of 3.4 percent of gross domestic product for the year to March 2020 as he announced the country’s pre-election budget on Feb. 1. That is higher than a previous target of around 3 percent. Goyal said that India also have a fiscal deficit to 3.4 percent for the current year, slightly missing its 3.3 percent target for the current year. Earlier this month, the Ministry of Statistics said GDP was expected to grow 7.2 percent in the current year. The benchmark Nifty 50 Index was trading up about 1.3 percent in midday trading after the budget presentation. Goyal took control of the finance ministry on Jan. 23. His predecessor, Arun Jaitley, is in the United States for medical treatment. India’s general election must be held by May.